Want to see double precision (FP64) in GLSL in action? Here is a small GeeXLab demo that renders a Julia fractal in single precision floating point (fp32) and in double precision floating point (fp64) at the same time. 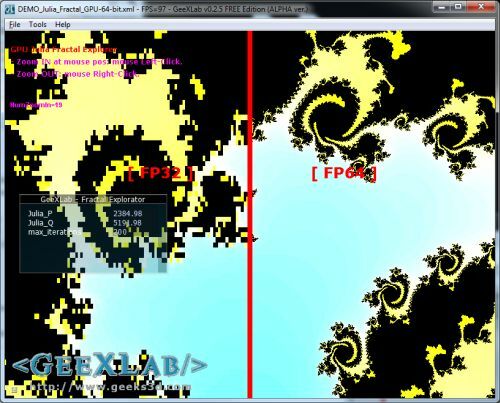 The Mandelbrot / Julia fractal is a nice example for showing the advantage of fp64 in shaders. On the left side, the rendering is done with fp32 and on the right side, fp64 variables are used. An unique GLSL shader is used for both fp32 and fp64 rendering. More information on the Mandelbrot fractal can be found here: The Mandelbrot Set: Colors of Infinity. Unzip the archive somewhere, and launch the file called DEMO_Julia_Fractal_GPU-64-bit.exe. That’s all. Controls: use mouse left click to zoom in at the mouse position, and mouse right click to zoom out. After around 20 zoom in, you should see the limitation of fp32 calculations. The source code is available in the DEMO_Julia_Fractal_GPU-64-bit.xml file. I tested this demo on a GeForce GTX 460 (MSI N460GTX Cyclone) + R260.63 without problem. I also tested the demo on a Radeon HD 5870 + Catalyst 10.9 and the first version of the demo didn’t work on AMD’s card. After a quick investigation, it turned out that on Radeon, the fp64 uniforms were not transmitted to the shader. Maybe a bug in Catalyst 10.9, I don’t know yet. The workaround I found is simple: cast fp32 uniform variables into fp64. That works fine for this demo but this trick is not the solution because you lose precision when you cast fp32 to fp64. // Works on NVIDIA and ATI. Thanks for the feedback. I will update the demo with, at least, the test of GL_ARB_gpu_shader_fp64 support! Oh i didn’t even see it requires a newer GPU, my bad sorry. On a 5770 and Cat 10.9, the FP64 rendering is completely wrong even on the initial zoom level.